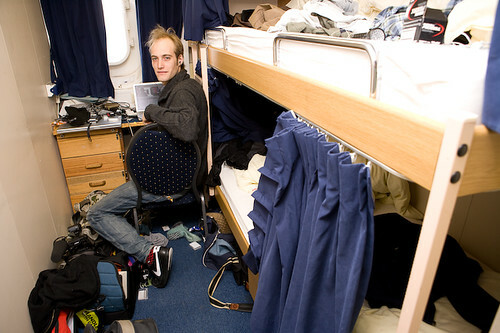 Cabin chaos (representing the general state of the boat). Matt Wainwright edits video for the website hours before we leave the Grigory Mikheev in Kangerlussuaq. Vanessa Carlton performs Heroes and Thieves, backed by Shlomo, on the bridge of the Grigory Mikheev as we return south to Kangerlussuaq. Emily Venables introduces Disko-very Bob, launched this morning from the boat and now the UK’s most northerly ARGO float. Over the next few years this remote unit will measure ocean temperature and salinity as it follows the West Greenland current, beaming back information every 5 days by satellite. Carol Cotterill and Dave Smith deploy the sparker, which uses acoustic pulses to image the sea bed and sediments below the sea bed. Video: Matt Wainwright. Marcus Brigstocke on ruined hedges and climate change fatigue. David’s ‘Hello’ is a great summary of the aim of the voyage and the whole project and gives an insight of what is happening on board. Sailing through the ice field near the mouth of Ilulissat Kangia, Danish name Jacobshavn Glacier (silent clip).